He proposed that the United States create (another) state-run media apparatus. There already is an official government agency that broadcasts news overseas: the U.S. Agency for Global Media, which produces (among other things) Voice of America, Radio Free Europe, and the Middle East Broadcast Networks. But the USAGM is outside of Trump's immediate influence (though he is making an effort to change that), and is designed to be nonpartisan. Its productions are also intended to be informative and reflect the United States in a positive light, which is very different from the commercial cable news programs that Trump is known to watch obsessively. 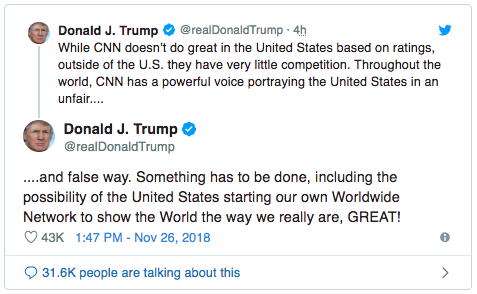 Trump routinely refers to media outlets he can't control as "enemies of the people," a phrase that has historical resonance in countries that have state-run media with the kind of more celebratory approach to their regimes that Trump seems to have in mind. It's not clear whether Trump knew these U.S. government overseas news agencies existed when he suggested that the U.S. government create an overseas news agency, or whether he simply wanted one he could control. Why should anyone care about this? Creating state-run media to celebrate the leader is what authoritarians do. Part of the job of being president is knowing what the government does.